I have just welcomed a group of new Practical Nursing students into their first skills class. From experience, I know that even though they have taken College 101, they need to get organized. 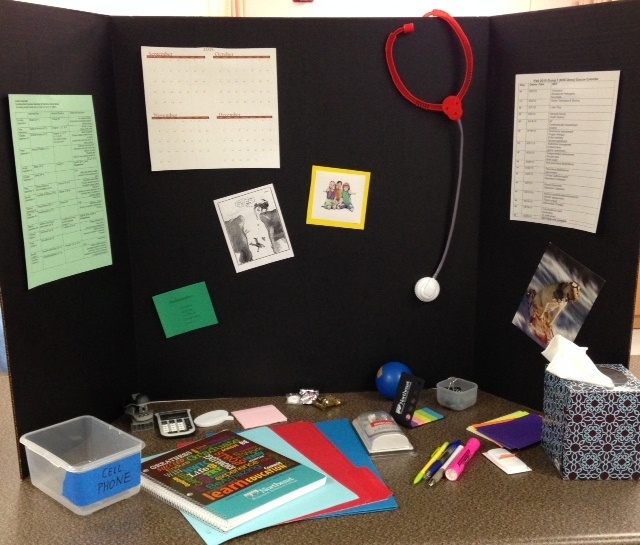 I set up this portable study carrel as an example so they can fashion a study space for themselves, wherever they are. The basic idea is: “No excuses!” The cell phone is off and goes outside the carrel; snacks, tissues and all needed office supplies are right there, so there’s no excuse to turn away from studying until a planned break. They can include their own pictures for inspiration and motivation along with course calendars. All this is very basic and logical, but could be a real help to any student feeling overwhelmed. Just set that carrel up wherever you are and voila’ – you’re ready to go! And it only costs $3 to buy the cardboard trifold! Wouldn’t you love to win the coveted Lab Rat of the Week Award? Sure you would, if you were in my Basic Skills Nursing class! I created this new award so that students could recognize one another for being role models in learning from their lab time. Each year there is a time lag before students realize that the more time (effective time!) they put into lab practice, the more successful they are. My plan is to have students vote on this weekly, so it will not be someone the instructor has chosen. I believe it will help them become more focused on professional behaviors as well. What constitutes the award? This really cool certificate, and the traveling lab rat stuffed animal. What more could a person want? I’ll post again later with student feedback. In the meantime, anyone for some cheese? How can students avoid being blind-sided by assignments and exams? As students begin their program nursing courses, they are usually overwhelmed with the myriad of assignments and due dates. They have often been working full-time and fitting in their prerequisites with fair success. Then they have to transition to focusing on at least three very demanding courses at once. To help them see the big picture, I prepare an 11 X 17 paper calendar of the semester for them, and they can fill in not only due dates and exams, but more importantly their study times. Too often they think linearly and only see what comes next. Many students have found this “old-fashioned” way helps them see the big picture, and not get caught when they turn a month page on their calendar and find something huge staring them in the face. While this especially appeals to those who are not digital natives, it can also show those using electronic calendars how to set up their own versions.